One of several important Old Masters of the Early Renaissance in Florence to be influenced by the great Masaccio, Andrea del Castagno also relied heavily on Donatello's sculptural qualities. He in turn, despite his short life, became one of the most influential figures in Early Renaissance painting, and his emotional power and naturalistic figurative art was emulated by many of his contemporaries. First documented as the painter of a cautionary painting showing the bodies of rebels hung upside down in chains, which endowed him with a reputation for violent realism, Castagno was a leading member of the disegno (drawing and design) tradition of the Florentine Renaissance, as opposed to the colorito tradition of the Venice-trained Domenico Veneziano, and is famous for his series of religious fresco paintings at the monastery of S. Apollonia, Florence (a Castagno museum). Among them is one of the most famous depictions of The Last Supper (1447). Also noteworthy are the nine portraits of his Cycle of Famous Men and Women (c.1449-51) at the Villa Carducci in Legnaia, based on models by Masaccio and Giotto, and the painted equestrian monument of Niccolo da Tolentino (1456) in Florence Cathedral. He remains one of the most important artists of the Renaissance in Florence, during the mid-quattrocento. Born Andrea di Bartolo di Bargilla at Castagno near Monte Falterona outside Florence, almost nothing is known of his early life and artistic apprenticeships. Moreover, since many of his paintings have been lost, it is impossible to identify the stages of his early development as a painter. We do know that the main influence on his art was that of Tommaso Masaccio (1401-1428), whose Brancacci Chapel frescoes exemplified the main tradition of Florentine art, namely the move away from Gothic art and towards naturalism and humanistic iconography. Not surprisingly therefore, the peerless Florentine sculptor Donatello also had a major impact on Castagno's figure painting. In addition, Castagno would also have been aware of work by other important Early Renaissance artists like Paolo Uccello (1397-1475), Fra Angelico (c.1400-55) and Fra Filippo Lippi (c.1406-69). In 1440, Castagno moved to Florence under the sponsorship of Bernadetto de' Medici, for whom he painted his first recorded work - a series of mural paintings (now destroyed) depicting the fate of rebels hanged after the Battle of Anghiari in the war between Florence and Milan. These pictures earned him the nickname Andreino degli Impiccati (Little Andrew of the Hanged Men). Other early works included his fresco of Crucifixion and Saints in the Ospedale di Santa Maria Nuova, and his frescoes in the San Tarasio Chapel of the Church of San Zaccaria in Venice (1442), some of which still survive. While in Venice he also painted a fresco of Death of the Virgin (1443) in St. Mark's Basilica. On his return to Florence in 1444, he designed a stained glass window for the city's cathedral. In 1445 he painted the fresco of Madonna and Child with Saints (Contini Bonacossi Collection, Uffizi Gallery), and became a member of the Guild of the Medicians. Castagno's greatest project was his cycle of fresco paintings featuring scenes from the Passion of Christ, which he painted for the refectory at the former Convent of Sant'Apollonia, now known as the Cenacolo di Sant'Apollonia. 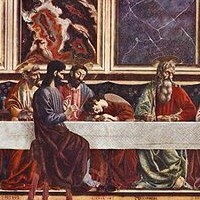 They include perhaps the most celebrated The Last Supper before that of Leonardo da Vinci, as well as The Resurrection (1447) and Christ in the Sepulchre with Two Angels (1447), all in the Sant'Apollonia, Florence. These vigorous, realistic paintings - characterized by some critics as the pictorial equivalent of Donatello's sculpture - revealed Castagno's own use of linear perspective, as well as Masaccio's pictorial illusionism, and received widespread acclaim. Towards the end of the 1440s, Castagno was commissioned by Filippo Carducci to paint a series of larger-than-life-size fresco Renaissance portraits of famous men and women, for a loggia of the Villa Carducci Pandalfini at Legnaia (all transferred to wood, and in the Uffizi, Florence). Completed by October 1451, the Legnaia cycle included nine portrait paintings - three Florentine army commanders, three Tuscan poets and three famous women; namely, Farinata degli Uberti, Pippo Spano, Niccolo Acciaioli, Petrarca, Dante, Boccaccio, the Cumaean Sibyl, Queen Esther and Queen Tomiri. Castagno set his figures in painted architectural niches, thus creating the illusion that they are sculptural forms. In 1450, Andrea del Castagno created his famous tempera-on-leather painting entitled The Youthful David (1450, National Gallery of Art, Washington DC). Later in 1451, Castagno continued the frescoes begun earlier by his friend Domenico Veneziano at the Church of S. Egidio, inside the Hospital of Santa Maria Nuova. In 1455, Castagno executed two intensely emotional altar frescoes for the Basilica della Santissima Annunziata. These works, which include: St Julian Receiving Absolution From Christ and The Trinity Appearing to Saints Jerome, Paula and Eustochium, were painted in lighter International Gothic tones that Castagno borrowed from Domenico Veneziano. The figuration was, however, intense. Initially, for instance, as the underpainting reveals, his Trinity was designed with calm and balanced figures. In the finished work, however, the figures resonate with agitation at the emaciated figure of St. Jerome and the crucified Christ. It is an excellent example of how the optimism and calm human drama of the earlier Florentine style was about to be superceded by a more expressive and linear style. Around this time, Castagno also produced his frescoed Equestrian Portrait of Niccolo da Tolentino (1455-6, Cathedral of Florence). Andrea del Castagno developed the tradition begun by Giotto and Masaccio, creating works of enormous power and monumentality, thanks to his sculpted figures and general naturalism. 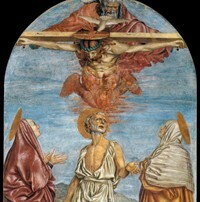 His art carried significant weight during the quattrocento - especially among artists in the region between Florence and Venice, such as the Ferrara school led by Cosme Tura, Francesco del Cossa (1435-77) and Ercole de Roberti (1450-96) - before being taken up and fully developed in the cinquecento by Michelangelo in his awesome Sistine Chapel frescoes. - Crucifixion (1450) National Gallery, London. - Eve (1450) Villa Carducci, Florence. - Madonna and Child (1450) Villa Carducci, Florence. - Portrait of a Gentleman (Undated) National Gallery of Art, Washington DC.  For more details about famous Florentine Renaissance painters, see: Homepage.  For an analysis of important Renaissance pictures, see: Famous Paintings Analyzed.